Nestled in the midst of the jungle along the Mexican Pacific Coast yet close to modern civilization of Puerto Vallarta is Villa Clavellinas. 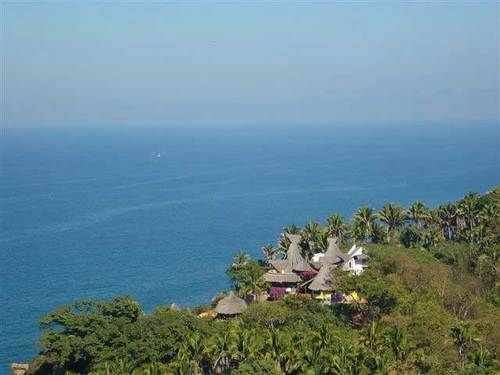 The property is located within a 25 acre private ecological reserve 4 km north of the charming town of San Pancho and only 45 minutes from the Puerto Vallarta International Airport. Cut from the jungle on a bluff over a rocky cliff, Villa Clavellinas enjoys panoramic views of the Pacific Ocean and cool sea breezes. A gorgeous two level infinity pool connected by a waterfall sits on the edge of the cliff offering an ideal spot to watch schools of whales and dolphins as well as flocks of pelicans, petrels, eagles and frigate birds. Villa Clavellinas has direct stairway access to a private white sand beach shared with just two other villas. There you can lounge, swim, snorkel, kayak, fish, play frisbee golf, hike and generally hang out. This exclusive villa of fine rustic Mexican architecture includes a spectacular 65 foot Palapa of hand woven royal palm fronds offering open air living space and multiple sitting and dining areas. Red terracotta clay tile floors throughout the villa are accented by colorful glazed Mexican tiles. The main house has three bedrooms each with private baths featuring open air showers in Mexican tile and terraces with ocean and jungle views. Two charming casitas with private baths, sitting areas and terraces make Villa Clavellinas ideal for larger groups of up to 40+ people. Included with the villa is daily maid service (except Sunday) and other on-site services can be arranged, including chef, food shopping and spa treatments. We provide chef services and fine dining experiences. The large outdoor patio is equipped with a 4 M dining table seating up to 14 under the stars or movable shade cloth during the mid day sun. Activities in the area can also be arranged such as boating, fishing, horseback riding, surfing, scuba, jungle adventure, and more. Howard Fields is a resort designer who discovered San Pancho and the Jungle/Beach and wonderful Mexican Villa he purchase and named Villa Clavellinas to be his private retreat in paradise. Always appreciating the simplicity of Mexico, bountiful fishing, gorgeous water and weather and the charm of the Mexican people he visits often and continues to enjoy this piece of paradise. Private, exclusive, gorgeous and close to a town. Sounds of the jungle and charm of the sea. Ideal weather and charmingly situated. In less than 6 hours from San Francisco can be in another world. San Pancho is a charming Mexican Town with many amenities including fresh fruit, meat and fish stores. Bars and restaurants and multiple shopping activities. Perfectly positioned for views, sun, sounds, weather and sunsets year round. Villa Clavellinas has a panoramic ocean view of the Pacific coast. Located 150 feet above the waves with full views and sun exposure. Perfect for sounds, bird watching as they fly by and privacy. The property has a lot of stairs so not suitable for guests with mobility issues. We provide a Chef and procure food and beverages for Guests. Two meals a day are included plus food costs.